Sometimes the most exotic of locales are closer to home than you think. When I brainstormed the possible locations and settings for a new Far Cry game in my head, Montana was certainly not on my shortlist. It’s an odd choice, but one that allows the team to do a lot of really interesting things and immerse players in a world that may feel all too familiar, and not a far cry from where they may call home. 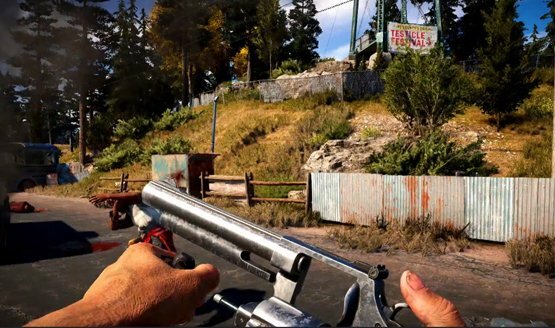 We got to take a brief look at Far Cry 5 at the reveal event, as well as interview the developers, but E3 gave us a chance to get our hands on taking down this religious cult that’s made their home in Hope County. The E3 2017 demo begins with picking a gun for hire. Nick Rye provides overwatch in an airplane, dropping bombs and making strafing runs full of machine gun fire. Grace Armstrong is a sniper providing cover fire from a distance, and can be directed where to post up for optimal sight lines. But of course who plays the demo and chooses any partner other than the dog, Boomer? As soon as the demo started, I turned around, whistled to Boomer, and we set off into the wilderness to start our new life away from the blood and mayhem of Hope County. Kidding. We murdered every religious fanatic in Fall’s End. The town was alive with terror, ripping people out of cars and buildings and executing them in the streets. Eye for an eye, right? I sent Boomer chasing after one guy, threw a stick of dynamite at another, and proceeded to take a potshot at a third as it blew up. I charged down the hill and onto the main street of Fall’s End, shooting every cultist in sight before pulling out red, white, and blue baseball bat to crack some skulls in the name of freedom. A second playthrough of this portion with Nick in his plane led to a satisfying explosion of a gas track, and his strafing machine guns kept the enemies from staying out in the streets. It was amazing to me how natural liberating this small town felt. Too many games make outposts and checkpoints feel gamified, meaning that they feel like just another thing on a checklist of things to do. Far Cry 5 brings the town to life, giving you a strong reason behind liberating it from these murderous criminals. It’s an emancipating power fantasy that hits all too close to home in the best of ways. Freeing the townfolk led to a new character offering a mission, which put me in the pilot’s seat of a plane myself. Taking off from the water was easy enough, and controlling the plane felt fairly intuitive while maintaining a level of realism and difficulty. It’s a difficult balance to make first person flight feel good, allowing player freedom to control the plane, but not making it so touchy and simulation-like that it becomes an impossible task. Machine guns, missiles, and even dropped bombs became the key weapons for taking out targets on the ground and eventually engaging in a dogfight against another plane, which again provided a satisfying level of difficulty while never growing too frustrating. The rest of the demo’s open world area was filled with exactly the things you would expect from a Far Cry game. Hunting, fishing, gathering supplies for crafting, running over bad dudes with a truck; all of these elements are clearly there. Far Cry has always been a great franchise and Ubisoft is pushing the envelope to bring a whole new level of detail to the living world in Far Cry 5. Who would have thought that I could feel so isolated in a setting so close to home? Previewed on PS4 Pro. Far Cry 5 releases February 27, 2018.